Proform have been on a real roll of late. We shouldn’t be surprised that one of the best known and oldest manufacturers of home fitness equipment keeps producing good machines, but what’s been impressive is their consistency. The last few bikes of theirs that we’ve reviewed have been very good so we were keen to see if we’d just been lucky so this time we opted to take a look at an entry-level model to see if it maintains the high standards we’ve come to expect, despite the low price point. Here’s what we found when we took a close up look at the Proform 210 CSX…. Like all modern home exercise bikes, the 210 CSX comes in parts and needs to be assembled. Thankfully, as we’ve come to expect from Proform user manuals, the instructions are nice and clear with good diagrams to show what goes where. Assembly is a one person job, though while attaching the main post at the front, a second person would make that part a bit less fiddly. Overall it took just 25 min to put this bike together so it shouldn’t present a challenge, even if you’re not of a particularly practical persuasion. The 210 CSX is a battery operated bike that can also run on mains power (the power supply is a paid for optional extra) and as you’d expect the batteries aren’t included. While the batteries are not officially included, our test unit did arrive with a pack of courtesy batteries included by the retailer, which is a nice touch. If you’re planning on running the bike off the mains this something probably worth checking with your retailer as a power adaptor from Proform is around £25. While mains power is always nice, the default battery-only option is actually a good one to have, as it means you can put the bike in any location without having to consider how/where you’re going to plug it in. Looks-wise this is a very standard looking home exercise bike. There’s nothing amazing about it, but it’s not ugly either. At 79cm x 61cm (31.1″ x 24″) it’s not a large bit of kit but it is well put together and Proform’s choice of silver and dark grey with a splash of burgundy combined with the overall size results in a nice, neat little package that’ll sit comfortably in most homes. Unlike many of its competitors, there are not a myriad of adjustments that can be made to the handlebars and seat. The seat height is adjustable and is the only possible adjustment. Now, this would very often be a bone of contention as it does limit the riding positions you can take up on the bike, but the 210 CSX is one of the few models that we’ve come across that doesn’t seem to suffer as a result of this lack of adjustment options. This can only be the result of Proform’s experience and know-how in building bikes as there wasn’t a member of the team that couldn’t get a good, comfy riding position. The seat is large and substantially padded, and this combined with the decent ergonomics makes this a comfortable bike to use. The 210 CSX is packed with a surprising amount of features for a bike at this price level. 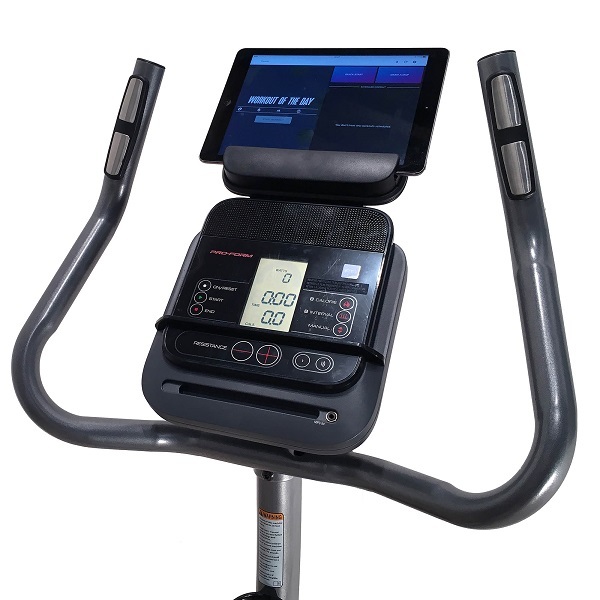 The console display is a silver-tinted LCD display that shows the intensity, speed, time, distance, calories and pulse in real time as you workout and there’s a tablet holder located on the top. There are 14 preset workouts divided into 7 intensity workouts designed to improve fitness and 7 weight loss workouts. In addition, there’s a dedicated 8-week weight loss training programme (more on that in a minute) and a target Watt program. Unusually for an exercise bike, let alone an entry-level exercise bike, the console is fitted with stereo speakers and a music port to plug in your mp3 player, a workout cooling fan to keep you cool, and Bluetooth wireless heart rate receiver and last but by no means least it’s Bluetooth smart enable for iFit so interactive training is an option. There’s even a water bottle holder which is always nice to see! That’s a lot of stuff on a bike full stop, but when you consider the price, it’s all the more impressive. Back to that 8-week weight loss training programme, because this is nothing less than a proper 8-week weight loss training regime designed by a personal trainer! Each week there are 3 workouts to perform, each one different from the last. The way it works is really straightforward and with just a little manual input to set it up, you’re ready to go. To get started just press the ‘select week’ button to select week 1, then press the ‘select day’ button to select day 1 and start pedalling. The next time select week 1, day 2 and perform the workout, then next time week 1, day 3 and that’s your first week completed. Continue like that for the following 7 weeks and you’ll have participated in a full on 8-week weight loss programme. It is basic in the way it works, but the fact it’s there at all is the bit that’s got us enthused! Really good stuff this, and given one of the most common reasons to buy an exercise bike is to lose weight, it’s something that’s sure to appeal to a large number of people. In terms of the warranty, the 210 CSX is covered by Proform’s 2-year parts and labour warranty (if registered within 28 days of purchase). 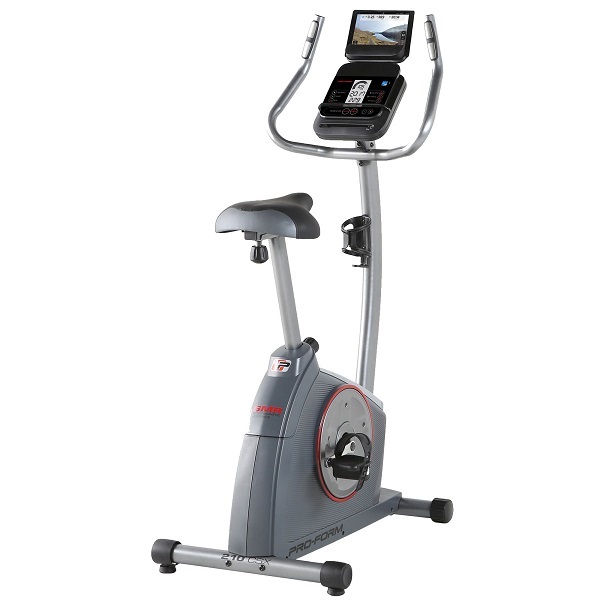 There are other, very good upright bikes available out there at this sort of price point and when compared to the best of them, the 210 CSX is a real contender. It provides training options that few, if any, of its direct competitors, can match and when it comes to add-ons such as fan, speakers, interactive training it’s out there on its own. This is a great effort from Proform! The ProForm 210 CSX is not currently available from any retailers we're aware of in the UK. It's not often you can find another bike at this price that offers as much as the 210 CSX. The lack of adjustments really isn't the problem we thought it would be and the sheer amount of features and functions for the money being asked represents really good value. It's solidly built too making this an easy choice, especially if weight loss is your main target. Overall this is a very strong offering and one that we're happy to recommend.